Timing of seasons is limited and activities take place in real-time, so you have to manage your workers efficiently. You have to cook meals for them and watch out for fatigue otherwise morale goes down. Family members improve in skills which make them faster and increases chances of critical success (ie. multiplying yields). Yields are determined by properties of crops in relation to soil fertility, weather and additional work. A workforce can be hired, but it is costly, but if you upgrade the house enough, perhaps a new baby will be born. As your family grows you can expand your farm and focus on long-term investments such as livestock or orchards. The Family Farm game launcher shortcut is located on your desktop and in the Start Menu under Family Farm. The launcher checks for updates and clicking Play will start the game. When you start the game, click ‘New Story’. Then select a land and story you want to play. The game features an Auto-Updating mechanism - it checks for a new version each time it's started and keeps itself updated (requires internet connection). Each profile is a separate save slot of in-game progress. If this is your first game, you will have to create a new profile. Name your profile and select it. You can then change active profile from main menu. continue: Continue a previous game. new story: Play a new story. You will need to select a land and then a story to play. custom story: Play a custom story. Set up story parameters you find challenging and fun to play. manual: Open an Internet browser and view the on-line manual. credits: These people sweated to bring you this farming game! options: Alter system and game related settings. leave game: Pressing ’Leave Game’ will exit the game back to your Windows desktop. The gameplay is really simple. When you start a new season, you are in Manager Mode. You can't do everything in Manager Mode, so prepare yourself for Planning Mode, Decorating Mode and Animal-Moving Mode. This is the main game interface. You will observe what's happening on your farm and command workers. Time flows naturally in this game. The season is represented by a day. It starts at 8 A.M. and ends in 6 P.M. Current time and season is shown in the bottom-left corner. Workers will get hungry as the day goes on. See Cooking for details. Workers will leave the house at the beginning of every season. Select a worker by clicking on the character. Character details will show up in the top-right corner. Hire additional workforce when you see men standing near the Work for Hire sign. They will cost you money in exchange for the additional workforce. Labourers you don't hire will go away in the morning, so don't take too long to hire them. Switch to other game modes by clicking on the buttons in the bottom-right corner. When you are ready to do some farming, switch to Planning Mode. The game world is tile-based and you can plan what commodity to grow on which tile. Every tile on your farm can be of a different type. field: Plant field crops on the field. Two tiles across. 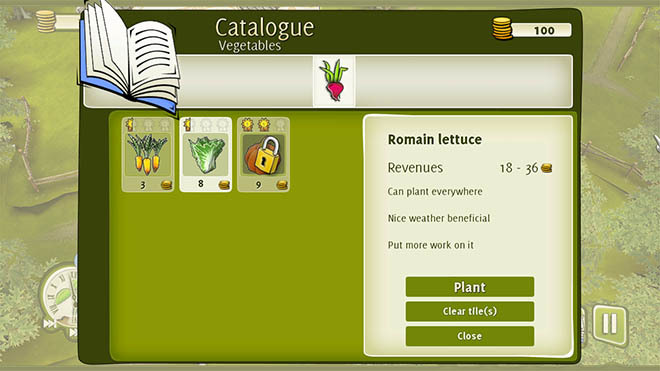 You can plant different crops each spring. The field loses fertility over time, you need to re-cultivate it. tree orchard: Plant tree on the tile. One tile across. One tree per tile. The tree grows as time goes by. Larger tree means larger crops. vegetable patch: Plant vegetables on the patch. One tile across. You can plant different vegetables each spring. Vegetable patch loses fertility over time, you need to re-cultivate it. Weeds sometimes spawn on the patch. animal corral: Build corral for animals. Two, four or six tiles across. The larger the corral is, the more animals you can have. Beware, the wood costs money. chicken coop: Build a coop for hens. One tile large. Beware, the wood costs money. 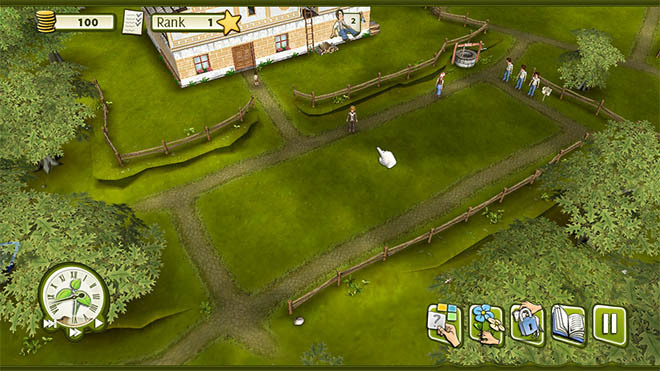 park: Parks can be used as spots for different game objects, such as food, cradle, bucket with water, etc. One tile across. Every park has flowerbeds to help your farm look better. When you assign a type to a tile, it's not ready yet. There is usually some work needed to use the tile. For example if you mark the tile as a Vegetable Patch, your workers will need to hoe the patch in order to plant vegetables there. A question mark on top of the tile means it's empty and ready to use. Click on the tile, browse the catalogue and select desired content. If you decide to clear the tile, click on it and select Clear Tile. Clicking on tile shows information related to the tile. Tiles are grouped into Tilesets. Tiles in the same Tileset share initial Field, Tree Orchard and Vegetable Patch fitness (which represents suitability for planting crops on the tile type). These are only initial values and can be boosted by regular work on the tile. Tile fitness is reduced every time crops are planted on the tile. Degree of reduction is based on every plant's need for soil fitness. I.e. demanding plants consume tile fitness more quickly. Don't forget to restore the tile fitness after every harvest. Flower symbols outside of tiles represents flowerbeds. They can be decorated with flowers and other decorative objects. Clicking flower symbols enters Decorating Mode. Cycle through Tilesets with arrows in top-right corner. Exit back to Manager Mode with large X. 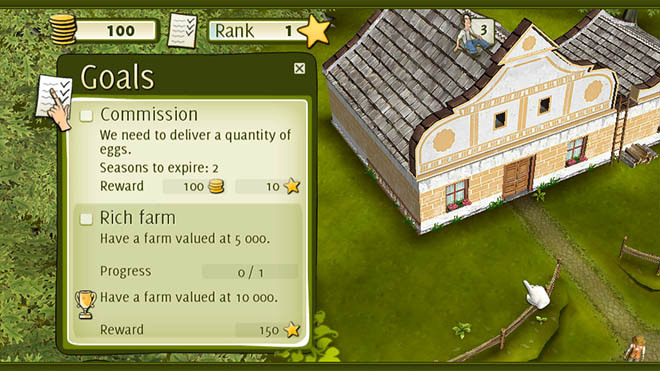 Decorating your farm not only makes the farm nicer, but has a positive effect on workers' morale too. Follow on-screen instruction and make it happen. There are six icons in the bottom-right corner. The hand lets you re-plant flowers or move decorating objects. The other five represent the palette and contains (or can contain) flowers and decoration objects you have bought from the catalog. If it's empty, click on it and buy something. If you find some of your flowers or objects boring, pick them with the hand and store them in an empty palette icon for later use. Or sell them, your choice. If you run out of flowerbeds, make sure you have all Tilesets cleared. Each tileset contains at least one flowerbed. If it's still not enough for you, make a Park on one tile. 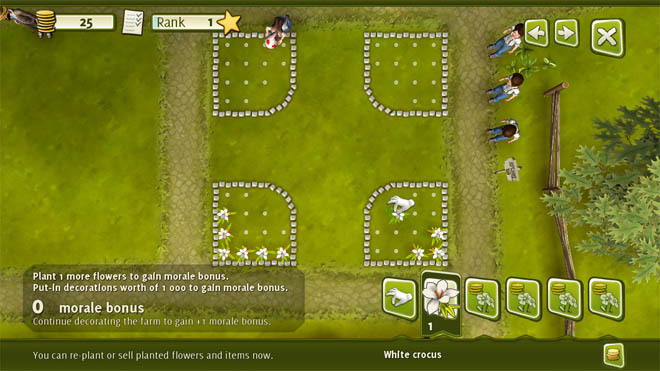 Cycle through flowerbeds with arrows in the top-right corner. Exit back to Manager Mode with large X. When you buy animals, they are placed into the corral. There are situations where you will want to move animals into different corral. When you enter Animal Moving Mode, you can pick up to 9 animals and drop them in any corral you want (if it is not full). If you want to leave the mode and you still have picked animals, you will be given the option to sell them. In case you don't want to sell them, drop them first. Your progress through the game is represented by your Rank. You get Rank Points by completing some activities. When you reach the next Rank, new farm content is unlocked. You can see how you are standing in the Rank Info window. Open it by clicking on the star icon in top-left corner. Remember that people on your farm are human beings like you and thus need to eat. The right part of every house is the kitchen. You can recognize it with the kitchen bell on the wall. 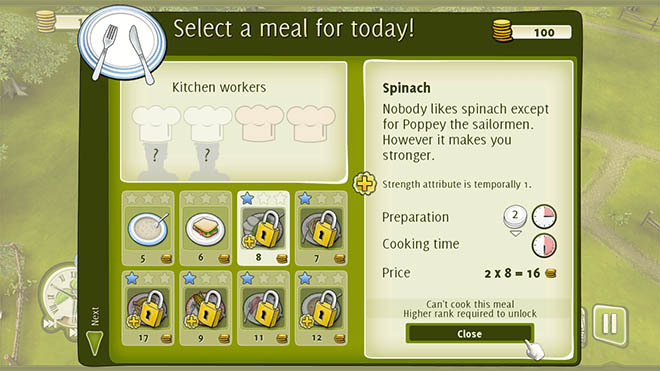 Clicking on the kitchen opens the cooking menu and sending people to the kitchen means the cooking shift for workers has begun. Depending on the level of your house, there are a number of spots in the kitchen. A larger house has a larger kitchen, which means more cooks can cook, which generally means more food will be ready sooner. Some meals have a critical effect. They have impact on your workers (can temporarily boost attributes, skills etc. ), but the scale of the effect is determined by chef's skill. Making the meal is divided into two parts. Preparing and Cooking. preparing: Any number of cooks (that can fit in the kitchen) can prepare a meal. More cooks means quicker preparation. When meal is prepared, everyone except the chef leaves the kitchen. cooking: Only the chef cooks the meal. He/She is the most skilled person in the kitchen at the time of preparing. If the food has a critical effect, then the scale of the effect is determined by chef's skill. Different meals have different requirements for preparation time and cooking time. Some are more difficult to prepare, some to cook. You can decide the number of portions to prepare. When you're in a hurry, cook an easy meal. Workers won't be happy, but they will be fed at least. The family that lives on your farm needs to sleep somewhere. And that's in the house. More beds can fit into a larger house, hence your goal is upgrading to larger house. Think carefully, materials needed to upgrade your house cost money and workers need to do the work. 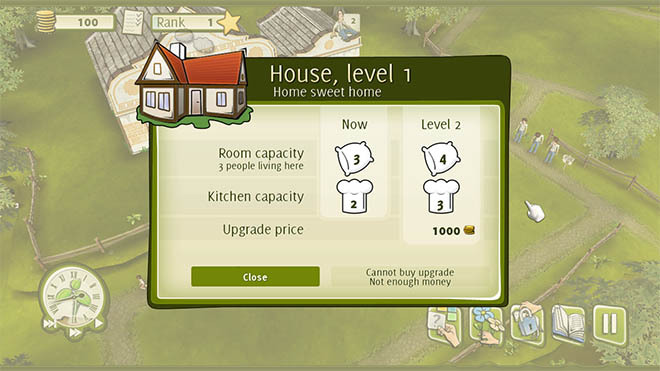 Clicking on the house opens the House Upgrade menu, this gives you a perspective on current and next level of houses. Larger houses can accommodate more people and usually covers kitchen upgrade too. When there's an empty bed in your house, you are given the option for your family to have a baby. Click on the cradle in front of the house and confirm that you want the baby. Plan your actions carefully, the mother is occupied for the whole season when the baby is born. All game content is displayed in the catalogue. The catalogue is invoked when purchasing content for a tile (by clicking on question mark symbol on tile). You can open the catalogue manually from Manager Mode. Content is filtered only to show content you can use in the current story. The catalogue is divided into tile content types, decorating items and foods. field crops: Price shown is "per work spot" (3 steps), not for a whole field. Field crops have different needs for sunshine, soil fitness and additional work, which has an effect on yields. trees: Price shown is for a young tree. Trees have different needs for sunshine, soil fitness and additional work, which has an effect on yields. vegetables: Price shown is "per work spot" (1 plant), not for a whole patch. Vegetables have different needs for sunshine, soil fitness and additional work, which has an effect on yields. animals: Price shown is per animal. There are male and female animals. Breeding is possible only if male and female animals of the same kind are in the same corral. hens: Price shown is per coop. parks: Price shown is for whole a tile. flowers: Price shown is for one flower (catalog opened manually) or for desired amount of flowers (catalog opened from Decorating Mode). decorations: Price shown is for one decoration object. foods: Price shown is for one portion. Meals with a special effect are indicated. You can, as a player, only decide what will be on which tile and what workers will do. It's up to them when the work itself is done. When a worker is selected, his/hers quick info is displayed in the top-right corner and a diamond-like object is shown above the worker's head. Clicking on a character's portrait (or clicking on the worker himself/herself again) opens a detailed character information window. A worker's portrait, name, fatigue, hunger and morale are displayed in the quick info box. Fatigue and hunger (as well as some other things) affects worker's morale. You don't want to keep the people hungry or tired, as they work significantly slower when their morale is low. Workers have 5 skills. As they perform work dependent on skill, they will get better at it. The higher their skill is, the better and faster they are finished. tilth: This skill will come in handy when cultivating the fields, hoeing, etc. hard work: This skill is handy when working with a hammer or axe, like upgrading the house, building corrals or coop, clearing wild tiles, etc. 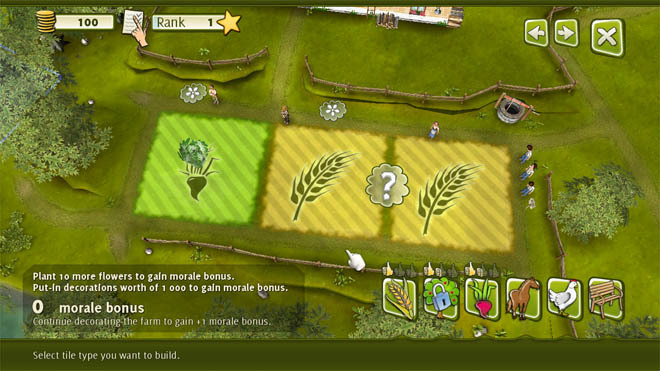 plants: Workers need plant skill when planting or harvesting crops. animals: This skill indicates how the worker can take care of animals. If the skill is low, animals may get scared when the worker is nearby. cooking: This is the chef's skill. When cooking meals with a special effect, their skill level changes the scale of the effect. Workers also have 4 attributes. Unlike the skills (that can improve in time), Strength, Dexterity and Vitality are fixed. strength: Determines worker's physical strength. Higher strength comes in handy with work depending on Tilth or Hard Work skills. dexterity: Determines worker's ability to improve his/her skills. vitality: Determines worker's disposition to fatigue and fatigue recovery. morale: Determines worker's resolution to work. Morale is calculated from worker's fatigue, hunger, environment and food eaten. Detailed morale breakdown can be displayed by holding the mouse cursor over a worker's portrait. Don't let workers' morale drop too low, they will not manage to finish their duties before the end of season. Keep your workers busy. If someone is idle, get the lazy punk to work! Idle workers are signalised by a sitting fella icon and the total number of idle workers. Click on that icon and the idle worker gets selected and ready to work. Each story has it's own goal. Something you need to accomplish in order to complete the story. Goal info can be opened by clicking on the To-Do List icon in the top-left corner. You will see progress you've done so far and reward for completing the goal. In addition to Story Goal, there's always a Seasonal Goal. Something you need to finish usually by the end of the year. The Story Goal has it's own Trophy version. When you are good enough to fulfill a Trophy goal, you are awarded with the Trophy. When there have been updates to goal information, the hand will pop on the To-Do List icon. Complete Seasonal Goals regularly. They are rewarded with Rank Points which will keep your Rank growing. 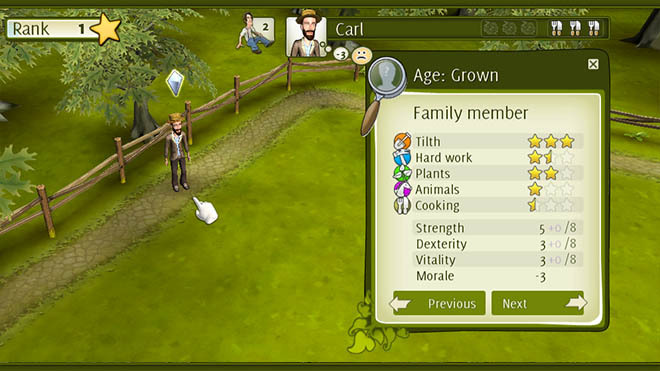 Time flows naturally in Family Farm. The year is divided into two parts. The spring and summer, or if you wish, planting and harvesting. The season is represented by a day. It starts at 8 A.M. and ends at 6 P.M. The current season is indicated in the centre of the clock. Later in the morning, when it's time for cooking, an empty plate is shown above the clock. If someone did not eat for two seasons, a red alert stays on top of the plate. If you do not feed hungry workers, the story will end in failure! In the summer (or harvest if you wish), the weather affects your yields. Some crops are more demanding than others, pay attention to choosing the right crop in rainy areas. Current weather is indicated near the clock. There are 3 weather types in the game: Sunny, Cloudy and Rainy. The normal pace of the game may not suit you. In that case, you can fast forward time (3x faster than regular speed) or completely skip the current season and go directly to another. Skipping a season is allowed only if noone is working. Time control buttons are in the bottom of the clock. Beware of skipping the season. There may be hungry people and the story can end with failure. There's always a plenty of work that needs to be done. Each working spot is indicated by a coloured Cog icon, with figure symbols in the centre. The number of figures represents the number of workers that can work on that particular job. Clicking on this icon will open a window with detailed information regarding the work - the skill needed for the task, how many workers can work there, difficulty of work and whether the work has any special effects. Please ensure that your system meets the hardware requirements. To uninstall Family Farm, browse to the Family Farm folder on your Start Menu, then select "Uninstall"
Alternatively, you can open your Control Panel, choose "Add/Remove Programs," select Family Farm then click "Remove." Family Farm homepage where you can find latest information. Contact Hammerware. If sending a bug report, please provide a detailed description of the problem you are experiencing (i.e. error message, where in the game the problem occurs, game log files, etc.). This will help our Representatives find a solution much quicker..
Where are game settings or logs located? The game settings, progress and logs are not located within installed files. The demo and full version shares the same files, so any progress you make in demo counts in when you buy full version. If you're on Windows XP, it's C:\Documents and Settings\All Users\Application Data\Family Farm. If you're on Windows Vista/7, it's C:\ProgramData\Family Farm. If you're on Linux, it's ~/.familyfarm. If you're on a Mac, it's ~/Library/Application Data/Family Farm. The game progress (profiles.db) is transferable within supported operating system. If you're switching operating systems, just copy this file over and you don't have to play all over again. The game does not start at all. Make sure you have latest video drivers installed and your video card and video card driver is compatible with OpenGL 2.0. In some cases, the video card may be OpenGL 2.0 compatible, but the driver implementation is not or is buggy (hello Linux). Open Terminal and run the game from the Terminal. It could provide more detailed info on reason why the game does not run. If you're on a Mac, open Terminal, type "/Applications/Family\ Farm/Contents/MacOS/Farm" and hit enter. It could provide more detailed info on reason why the game does not run. The game starts to Main Menu, but crashes after starting New Story. Double check that you have latest video drivers installed and your video card and video card driver is compatible with OpenGL 2.0. If you're on Windows, try to check "Use OpenGL" checkbox in Launcher application and see if the game starts. The game runs fine on netbooks (integrated Intel cards) as well as nine years old NVidia and Ati cards. If you're on Linux, you probably have installed opensource video drivers. Install proprietary video drivers instead of opensource drivers and see if the game starts. The game does not run on Intel video cards on Linux at all. Linux video drivers (in general) don't get much attention from device manufacturers as Windows drivers get. If you're on a Mac, make sure you don't have Intel video card. If there's a way to install updated video drivers on Mac, do it. The game might run on recent Intel video cards, but it (for sure) does not run on Intel GMA 950. The game runs fine, but crashes. This should not happen, but it does sometimes. If you are experiencing regular crashes after the same action in the game, send us detailed info how we can reproduce the crash so we can fix it for you. Don't forget to include info about your operating system and your hardware in the email. How can I check for new versions? There is version number in the top-right corner in Main menu. 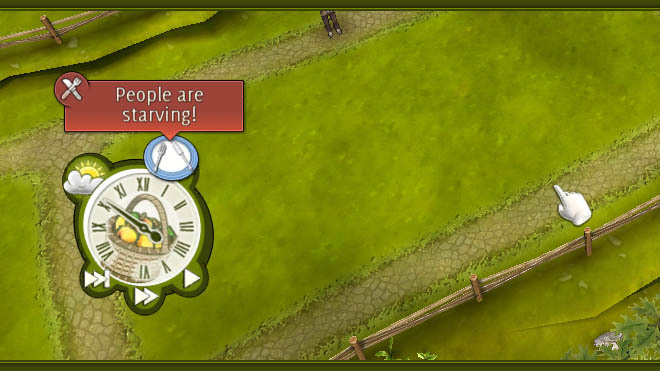 Remember that number and check downloads section at http://www.familyfarmgame.com. There's a current version number indicated for all platforms. If you're on Windows, you can enjoy the comfort of automatic updates within Launcher application. If you're on Linux or a Mac, you need to download the game again and re-install it. Don't worry, the game progress is located in different directory, so you won't lose your progrss. If you purchased the game from our site, there's always current version for download, use the same download link as the first time. If you purchased the game somewhere else, check if they have an updated version for you. Scrolling on Linux in windowed mode. The Linux environment has some limitations when it comes to input management. When the cursor leaves the window, the window stops receiving information about the mouse. If the cursor leaves the window too fast, it may not reach the scrolling area. Keep your mouse slow at window borders if you want smooth scrolling. Antialiasing cannot be set to more than 1. On some platforms, antialiasing cannot be set to more than 1. This is a limitation of how the 3D engine we're using checks for antialiasing support. Make sure you don't have 640x480 video resolution in Settings under Main Menu. If you have better resolution set already, then sorry, the game is supposed to look like this. The system requirements we have are the minimal system configuration the game runs on. If you want better game experience, you will need a better CPU or video card. The video quality can not be set as the default settings is extremely low compared to cutting-edge games. Making Family Farm window appear on specific monitor is available only by editing configuration file manually. It's not tested on Linux nor Mac, so no guarantees there. Open appconfig.cfg file located in directory mentioned above. If there's option named monitor, change it from 0 to 1. Monitor index starts on 0 and goes up. If you have three monitors and you want to FF appear on third, use 2. If there's no such option or no appconfig.cfg file at all. Add line monitor=1 to [ogre] section or use following config contents to change monitor index. PBuffers or FBO in OpenGL (mostly Linux and Mac). There are two methods for rendering to texture in OpenGL. The old PBuffers and newer FBO. Due to compatibility reasons, PBuffers are enabled by default. FBO can be enabled manually by editing config file. It may bring some speedups, but probably won't. Open appconfig.cfg file located in directory mentioned above. If there's option named usepbuffers, change it from 1 to 0. There's probably no such option (just two lines with language) or no appconfig.cfg file at all. Use following config contents to enable FBO support. The vertical synchronization is enabled by default. You can disable V-Sync in appconfig.cfg file. Add vsync=0 to [ogre] section. The game has a feature that limits number of frames rendered per second. That saves some CPU time which has possitive impact on CPU fan speed, notebook battery life etc. The default setting is 30 frames per second, you can alter it both ways. You can control frame limiter in appconfig.cfg file. Add fps_limit=30 (change 30 to number you want) to [user] section. Mouse cursor does not move smoothly. © 2011 Hammerware. All rights reserved. Microsoft®, Windows® and DirectX® are registered trademarks of Microsoft Corporation. All other brands, product names and logos are trademarks or registered trademarks of their respective owners. All rights reserved. OGRE (www.ogre3d.org), available under the MIT License. Graphical Installer (unsigned-softworks.sk), available under a custom license. Boost (boost.org), available under the Boost Software License. TinyXML (www.grinninglizard.com/tinyxml), available under the zlib license. cURL (curl.haxx.se), available under a MIT/X derivate license. SQLite (www.sqlite.org), available under the public domain. OIS (www.wreckedgames.com), available under the zlib license. NVidia Cg (developer.nvidia.com), available under the Custom free license (binary only). Particle Universe (fxpression.com), available under the Particle Universe Commercial License. Google Breakpad (code.google.com/p/google-breakpad), available under the New BSD License. OgreMax (ogremax.com) v2.1.3, available under the OgreMax Free License. irrKlang (www.ambiera.com), available under the irrKlang Pro License. cAudio (caudio.deathtouchstudios.com), available under the zlib license.